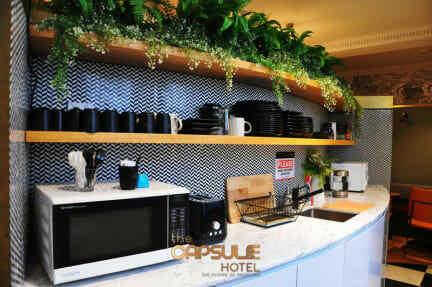 The Capsule Hotel i Sydney, Australien: Reservér nu! 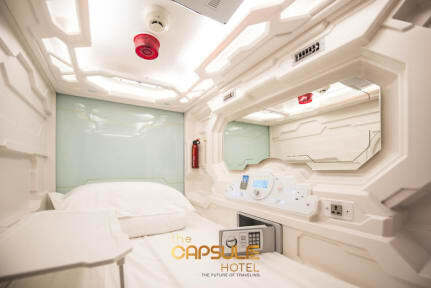 The Capsule Hotel offers futuristic-style accommodation in the heart of the Sydney CBD (Central Business District) and above The Century Bar, which has a range of tap beers and a wide selection of cocktails darts and other entertainment. The Capsule Hotel is situated on the corner of George Street and Liverpool Street and within a 2-minute walk from Town Hall Railway Station, offering access to all of Sydney’s top attractions. including Hyde Park, Darling Harbour, World Square ICC Sydney Theatre and Pitt Street Mall. Darling Harbour and Chinatown are both within a 5-minute walk. Sydney Airport is 20 minutes away by train or car. Free WiFi is provided throughout the property and rooms. Featuring front or side entry, each unique capsule comes with in-capsule safety deposit box, a secure locker, USB plugs, a mirror and adjustable lights with power point. All rooms are air-conditioned and bed linen is provided. Our deluxe side entry capsule includes android TV and towels. Laundry facilities are available for an additional charge. Solo travellers particularly like our location — they rated it 9.1 for a one-person stay.